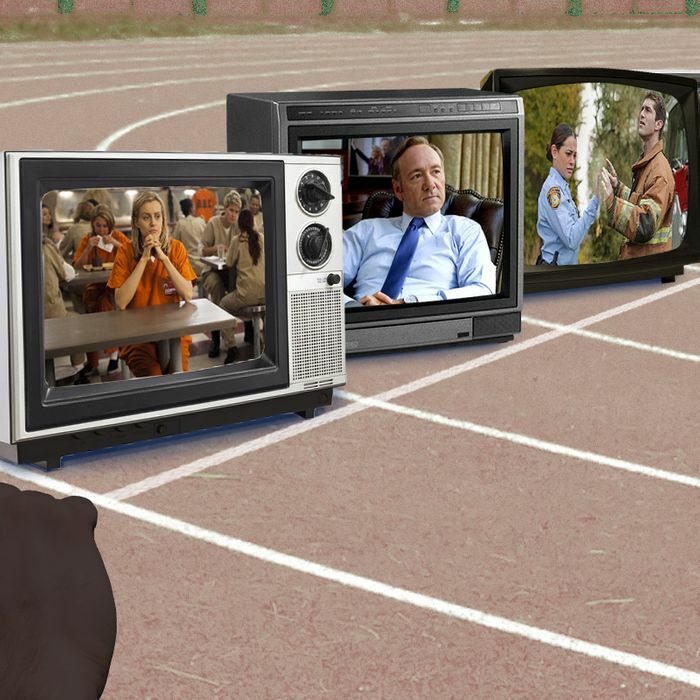 For years now, network TV has developed new shows in the same way: Every season, each broadcaster commissions a couple dozen pilots for a few million dollars apiece, then picks between one-third to one-half of them to go to series. But since it got into original programming in 2011, Netflix has streamlined the process, commissioning full first seasons of shows such as House of Cards and Orange Is the New Black without ever seeing a pilot. It’s not the first to skip this once-sacrosanct step: Networks have occasionally agreed to go directly to series in order to land high-profile projects, from the massive 44-episode commitment NBC made to Steven Spielberg’s Amazing Stories back in 1985 to CBS’s more recent pilot-free order of Spielberg’s Under the Dome. But this year, what was once a rarity has become far more commonplace. Fox is leading the way, handing out series commitments to more than a half-dozen 2014 projects, including a high-profile comedy from Tina Fey, the fantasy adventure Hieroglyph, and the Batman-inspired Gotham. ABC, CBS and NBC have all also ordered at least one early series sans pilot. “It’s become the big thing this season,” says Bela Bajaria, head of NBC-owned production studio Universal Television. While both competitive and financial pressures are at the root of the move, some small-screen execs see skipping pilots as a means to a larger end: shaking up the sclerotic system of series development that’s been in place at the networks for decades. There are creative advantages to the no-pilot approach. In the old model, writers design a pilot, and then wait for months to worry about what comes next. When they finally get the green light, they immediately need to staff up a writers room and then spend the season scrambling to churn out scripts that stay just ahead of the production schedule. Reilly says they’re “like Lucy at the chocolate factory, with the conveyor belt going faster and faster, and they can’t keep up with it.” Skipping a pilot and ordering multiple scripts means both showrunners and execs “can put the pieces together, and the plan for the show together, much earlier,” says CBS Television Studios president David Stapf, whose studio co-produces Dome and the upcoming Halle Berry straight-to-series project Extant. “You’re ahead of the game.” Writers with extra time can discover emerging problems and then go back and retool earlier scripts to preempt them before they’re shot. Universal’s Bajaria says long-range planning was key to the success of her studio’s Carlton Cuse–Kerry Ehrin thriller Bates Motel, which was sold to A&E without a pilot: “We had six episodes written before we even started filming.” The producers of Gracepoint, Fox’s pilot-free adaptation of BBC America’s Broadchurch that’s planned for next season, have already cast several of their leads, are working on multiple scripts, and, after a January production start, will likely have multiple episodes filmed by the time Fox unveils the shows to advertisers at its upfront presentation next May. Fox’s Reilly doesn’t give Netflix quite as much credit for the move as some execs do, and he correctly notes that he started handing out series orders (Terra Nova) long before Netflix got in the game. And yet, he admits the Internet programmer is helping change the rules. “I’m not following those guys, but they are giving me an assist,” he says. The straight-to-series model “is more out there, and it’s beginning to get everyone out of lockstep. And when there’s success, it really helps.” So far, the track record for no-pilot projects is mixed. Under the Dome was one of the year’s biggest hits, and Bates Motel also did well and will be back for a second season. Netflix doesn’t say how many people watch its shows, but it has ordered second seasons of every one of the series it’s developed. On the other hand, the aforementioned Terra Nova was an expensive, modest-ratings performer that was canceled after one season. Over at NBC, network chief Robert Greenblatt’s decision to hand Michael J. Fox a 22-episode series sight unseen did nothing but give the Peacock yet another low-rated Thursday comedy.